The results of the statewide machine recount which rolled by the Thursday 3 p.m. deadline, solidified what was expected: Ron DeSantis is (probably) Florida's next governor. 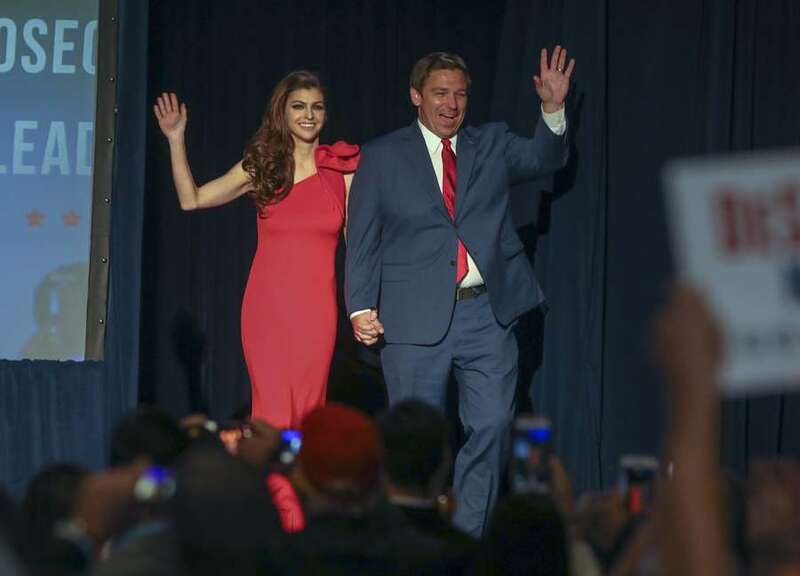 CHRIS URSO | Times Florida Governor elect Ron DeSantis along with his wife Casey wave to the crowd Tuesday, Nov. 6, 2018 in Orlando. DeSantis defeated Democratic candidate Andrew Gillum. Nine days after Election Day, and one machine recount later, it is all but official: Ron DeSantis is Florida's next governor. The results of the statewide machine recount which rolled by the Thursday 3 p.m. deadline, solidified what most already knew, as DeSantis has already made himself busy with transitioning to power and creating a new government. In the governor's race, it was an anticlimactic finish to the dramatic machine recount — plagued with technical issues and an avalanche of lawsuits — with almost no change in the margin between DeSantis and his Democratic opponent, Andrew Gillum, since this weekend. Still, about 0.41 percentage points separate the two candidates, or just under 34,000 votes. Just after the results were released, DeSantis sent a statement to reporters declaring victory — once again. "I remain humbled by your support and the great honor the people of Florida have shown me as I prepare to serve as your next governor," his statement read, striking a more conciliatory tone than the confrontational-approach he used in the campaign. He said the campaign must now end so it can "give way to governing and bringing people together to secure Florida's future. With the campaign now over, that's where all of my focus will be. "And, to this end, I invite Mayor Gillum to join me in the days ahead in a conversation about the future of our great state." Unlike the races for U.S. Senate and commissioner of agriculture, DeSantis' margin of victory is not slim enough to proceed to a manual recount, which requires the race to be within one-fourth of a percentage point. That means Thursday is the end of the road, and barring a lawsuit that demands a change in procedure, the governor's race's official results will likely be submitted by the counties on Sunday and will likely be officially certified on Tuesday, Nov. 20. Despite the fact that DeSantis still had about 34,000 more votes than Gillum, over the weekend, the fact that the race's margin slimmed to less than half a percentage point after Election Night triggered an automatic machine recount and left a haze of uncertainty over the results. Those question marks have fueled some last-ditch hope in Gillum's supporters who've been spotted sparring with pro-DeSantis protesters – including U.S. Rep. Matt Gaetz – outside the Broward Supervisor of Elections Office, and who've given Gillum hearty receptions at several post-election events. At these appearances, Gillum has continued to call for every vote to be counted, invoking a chance he could still be victorious while also preparing his supporters to stay engaged if he loses. "I wanted so bad, and still want so bad, for us to be able to make a combined impact on this state and I'm trusting that we're going to have that opportunity," Gillum told a church filled with supporters in Orlando on Tuesday. "Once we get beyond this election, whatever the outcome may be, we will have to commit ourselves to an improved and a better democracy." Once the results of the machine recount were submitted Thursday afternoon, Gillum issued an ambiguous statement saying, "It is not over until every legally casted vote is counted." Meanwhile, DeSantis has posted several quick videos that have depicted him as a governor-elect, as he spoke in front of a velvet backdrop flanked by flags or in the state Capitol building, giving broad updates on the transition. "We're hard at work and if you want to work for the administration, if you have something to offer, send us your resume," he said at the end of his most recent video, posted Monday. That day, the team opened their transition office in Tallahassee and began the long work of recruiting new hires for both the governor's office and for the state agencies. Also on Monday, DeSantis' team announced its first round of hires to fill out the transition's staff since its core leaders were announced. One of the most notable is James Blair, the transition's director of policy, who helped lead House Speaker Richard Corcoran's pseudo-campaign for governor that never materialized. Taylor Budowich, who ran communications for that campaign as well, also has an official DeSantis transition email account, according to records obtained by the Times/Herald. After first endorsing DeSantis' Republican opponent, Adam Putnam, in the primary, Corcoran joined DeSantis' ranks in the general election and is now helping lead the transition. His official role, in addition to his former campaign workers joining the efforts, ensures the fiery, outgoing speaker with a reputation for strong-arming policies through the Legislature will play a major role in DeSantis' setup and perhaps in the administration. Several other recent hires are holdovers from the campaign, such as Dave Vasquez, the press secretary, and Claire Whitehead, who traveled with Casey DeSantis on the campaign trail and has now been hired as the incoming first lady's assistant. Meanwhile, other additions formerly worked for other DeSantis political allies, such as a former advisor to Gov. Jeb Bush, Chris Clark; staff assistant of Sen. Marco Rubio, Amanda Emmons; and a lawyer who used to work for Gov. Rick Scott, Ben Gibson.